I came up with the idea to write this article after a Christina's member got married. He invited the whole company and my expat colleagues asked me many questions related to this topic. 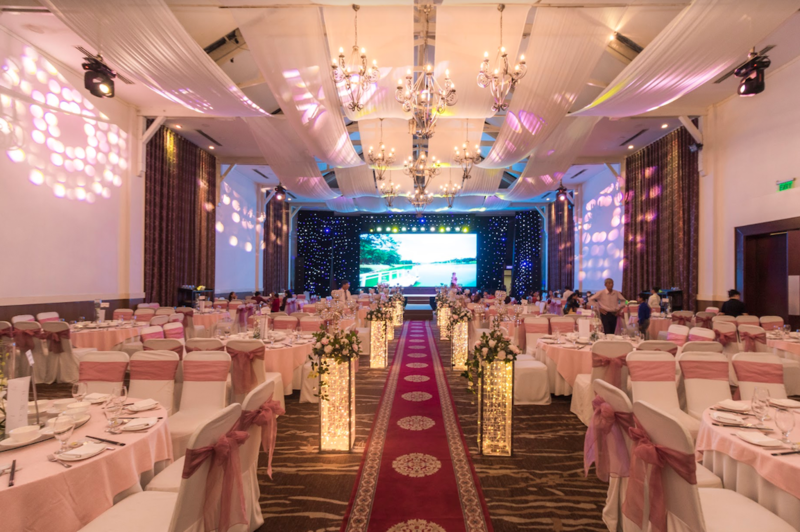 If you are in Vietnam long enough, or stumble upon a wedding or an invitation, here are a few things you should know. 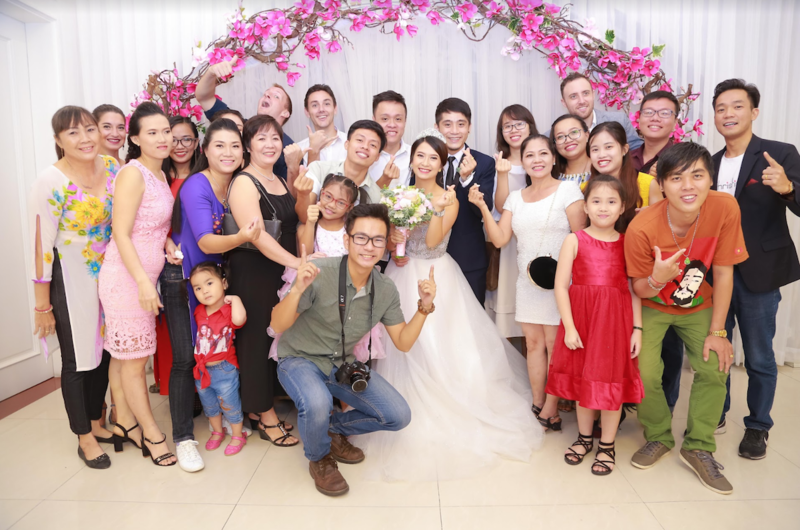 If you are living in Vietnam, there might be a day when you are invited to a Vietnamese wedding. 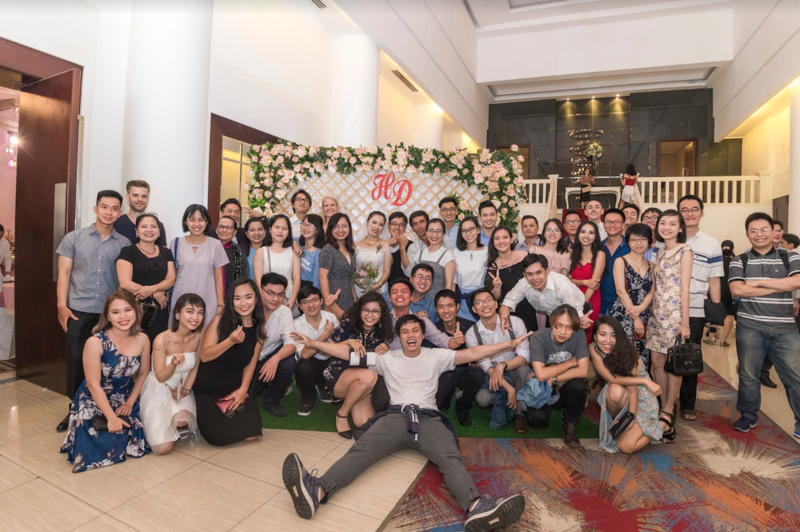 This could be a coworker, a friend of your expat community might marry a local Vietnamese, or you could just be invited if you are in the right place at the right time. 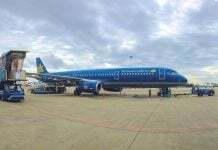 Love is always in the air! 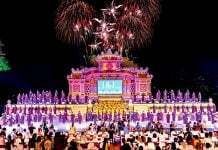 This kind of festive event is a great way to understand another culture, through celebration. You will notice certain customs and traditions of a given place, and the best part is you will be invited to take part. Yet, you might also feel lost when thinking about some common things like what to wear, what to gift, and what to do in the wedding to show your respect to the family, while making the most of the party. I have you covered with this pocket list of things you should know before joining a Vietnamese wedding. In Vietnam, a wedding is a good chance to put in the extra effort when it comes to choosing an outfit. It’s time to dress up nicely! On this occasion, the ladies usually pick a sophisticated cocktail dress or formal long dress. Some will come to the wedding in the traditional ao dai. Meanwhile, the men usually wear jeans or khaki pants and shirts. They may suit-up! It’s always nice when friends include a dress code on the wedding invitation. But what if they don’t? Which color should you wear to show your respect to the tradition and the couple? You can wear elegant clothing in any color that you want. 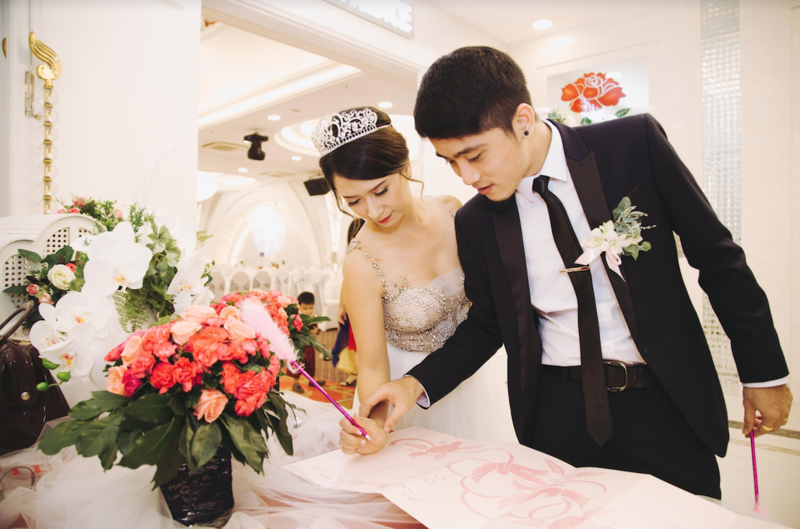 If you are still in doubt, it’s better to ask your friends about the wedding theme, so that you can choose the right color to wear. In the past, black and white were two colors that you could not wear to a wedding. 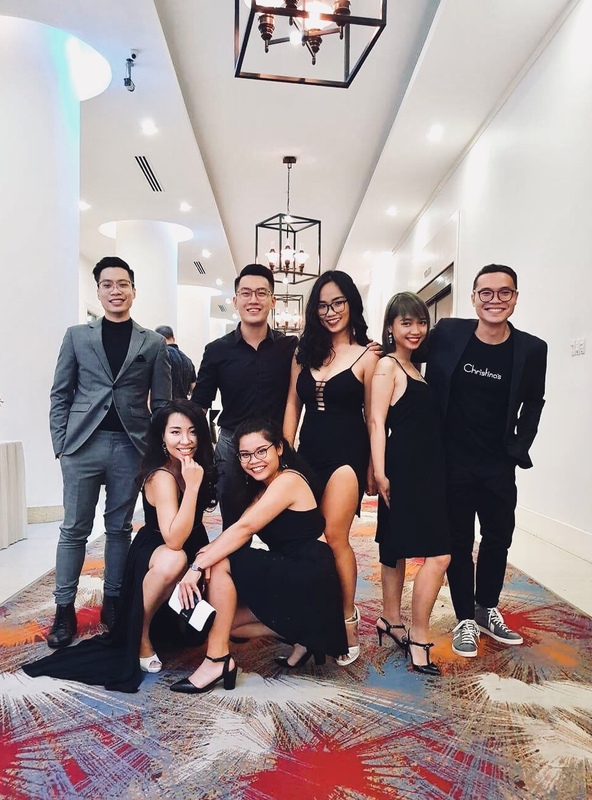 Even though black is a symbol of elegance in fashion, it was seen as a bad luck sign in Vietnamese belief, we only wore black to attend funerals. And of course the white dress was also an off-limits item since only the bride should be dressed in white. 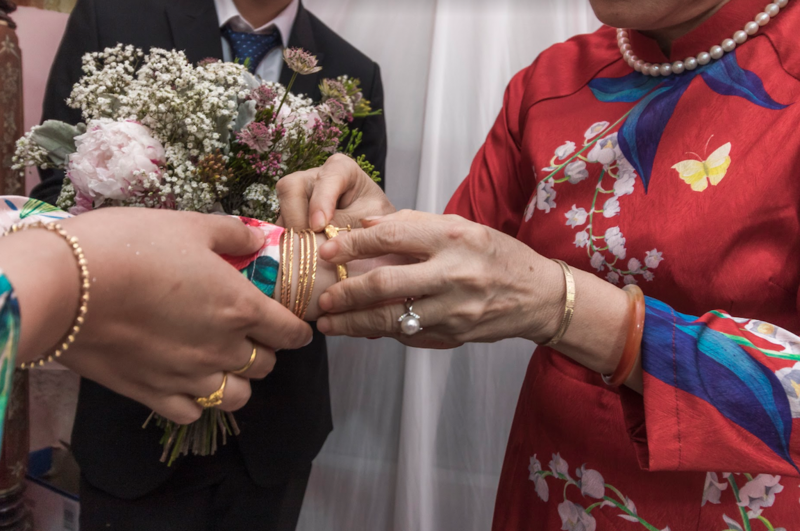 Normally, the old people in the family (like parents, grandparents, aunts and uncles) and very close friends of the bride and groom will gift gold and jewelry to the couple. Otherwise, we gift the couple with celebration money in an envelope. The amount of money you should gift depends on how close you are to the couple and the wedding hall venue. Family member: Gift your family a lottery ticket! Who knows they might be a billionaire afterwards. I’m joking. You can gift them whatever you want. Another way to decide the amount of the gift is to base it on the wedding venue. 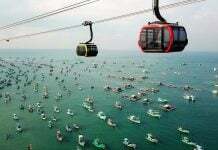 If you are invited to a casual restaurant or the couple’s house, it’s okay to give 300,000 VND. Otherwise, if they host their wedding in a five-star restaurant or resort, you might want to gift 500,000 VND and above. And it’s okay to ask other friends or colleagues how much they will gift beforehand. What not to give a couple? A pair of shoes: When people wear shoes, it means they tend to go out. Therefore, when you give shoes to someone, it means you wish them to walk out of their life. On the other hand, the word “shoes” in Chinese sounds like a sigh, which means you wish bad luck upon the receivers. Watch/Clock: A watch might be a common gift in Western countries. But here, the superstitious Vietnamese (and Chinese) believe that since a watch or clock is the tool to measure time, somehow it means you are measuring the time of your life… or you mean to wish the receiver a short life. Handkerchief: A handkerchief is used to dry tears and sweat which is related to sadness and distress. Thus, it is not a good gift. On top of that, why would you gift a newly wed couple a handkerchief? Knife or scissors: Some people tend to give the couple kitchen utensils so they can use them in their new home (if they decide to move out of their parent’s house). But the utensils shouldn’t include a knife or scissors because it means the tool to “kill the vibe” or “cut the relationship”. It is also believed to bring bad luck. Should You Bring an Extra Friend? 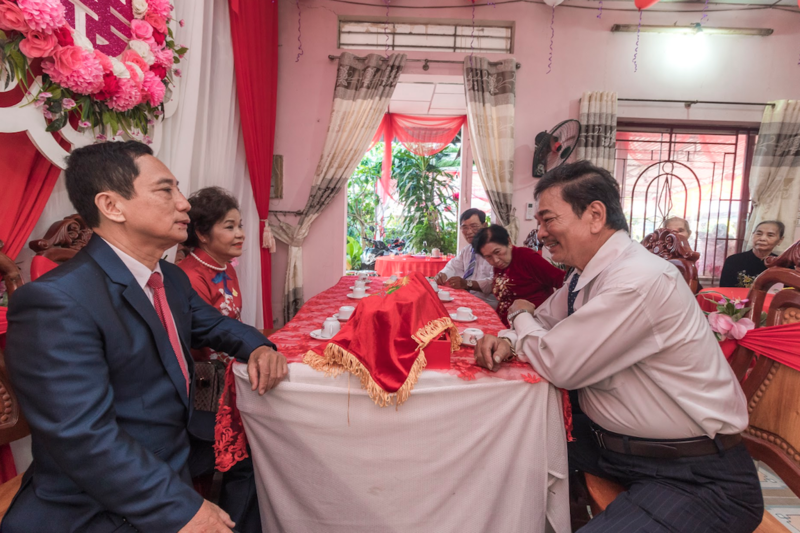 In Vietnam, a wedding is not only a happy day for the couple but also a day for the parents to show off their social status. It’s often normal that the marrying couple and guests do not know each other, just because they have to invite their parents’ guests. This does not mean you should bring an extra friend without any notice. When you receive your wedding invitation, if you see a plus sign (+) next to your name, it means you can feel free to bring an extra guest. In case you wish to bring a friend but there is no “plus” on your card, be kind to inform the bride or groom a few days in advance. What Time Should You Go to the Wedding? Hon le means wedding ceremony. This ceremony usually happens at the bride’s house in the morning of the wedding, in which the groom, his family and friends will bring dowries to the bride’s house for custom activities. The bride will then be brought to the groom’s home. Guests are always welcome to join the couple for this heartwarming moment. But do know that this is mostly a family time, so if you want to partake, let the bride and groom or their relatives know ahead of time. Tiec ruou literally means alcohol party. This is the party that you must join! The time stated in this section is when the couple starts greeting guests. You are allowed to take pictures with the gorgeous bride and groom in front of the wedding hall for about 30 minutes to an hour. You should estimate your travel time and come to the wedding around this time frame as it will be awkward to arrive when they are walking down the aisle to the stage. Follow the agenda, food is served after the introduction ceremony on stage. The groom and bride will stand in the wedding hall to greet the guests. You will go to the reception desk to drop off your money/gift, sign your name and write down your warm wishes. After that, it’s photo time! 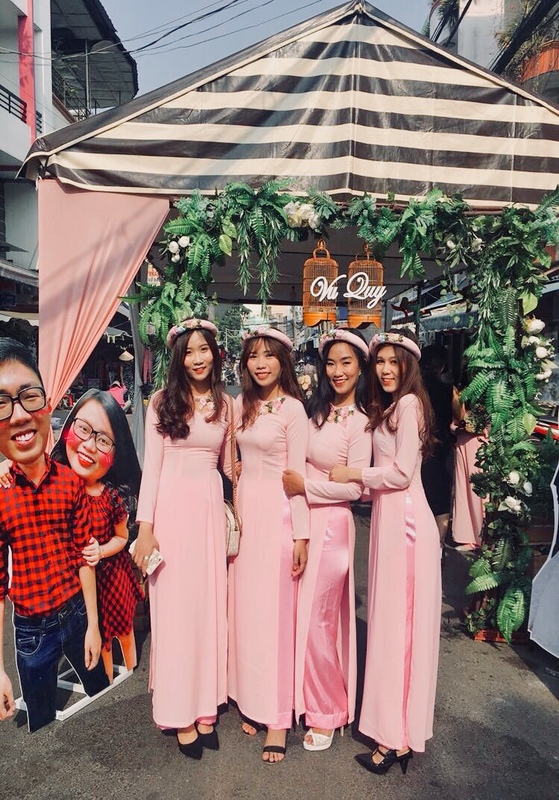 You should take pictures with the couple first (if you don’t know the couple, you can take a group photo with them, together with your friend to make it less awkward). Then you can hang out in the hall or enter the dining room. You will be guided to your seat. Stage two: The introduction of the bride, groom, and their family to the guests. 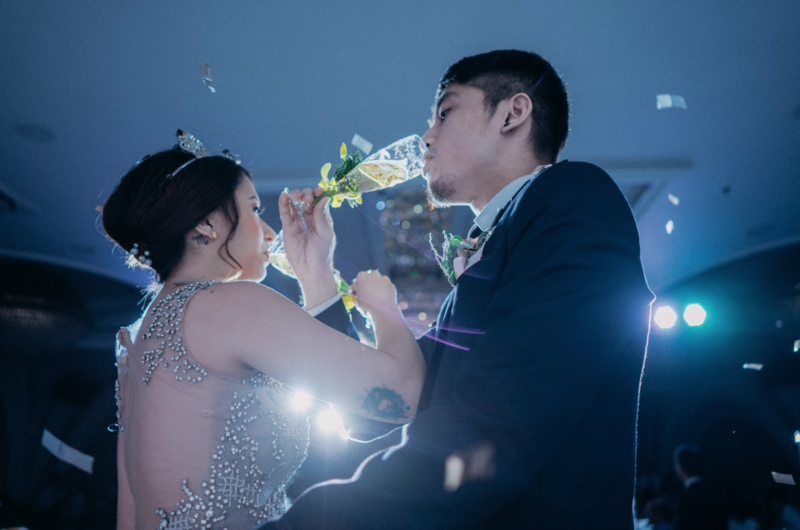 During this section, there will be an opening dance by professionals hired by the venue, then the parents and the couples will walk to the stage to perform a few ceremonies such as pouring champagne on the pyramid of glasses, cutting the cake, and drinking champagne. Third stage: This is the moment you have been waiting for: dine and photograph. 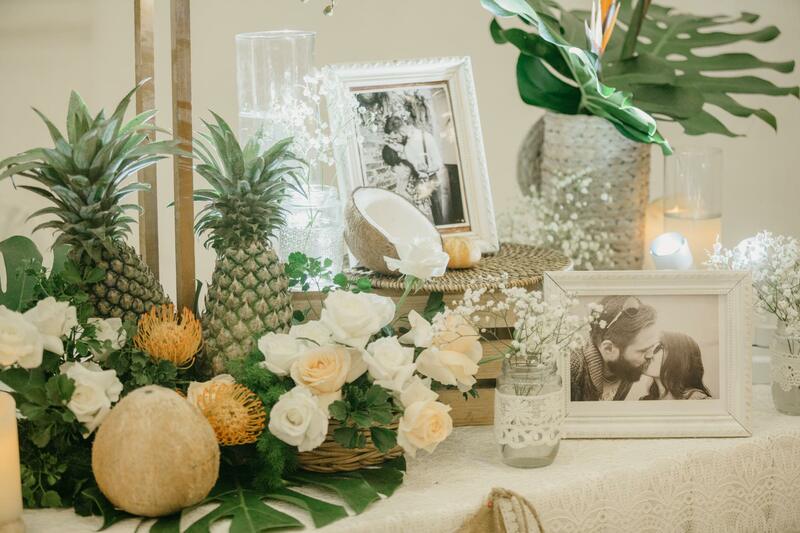 While you have your feast, the groom and bride together with their family will go to every table to drink, take pictures and receive blessings from guests. At the same time, there is also an open mic on stage. Unlike weddings in the west, guests don’t dance at the party, we sing along to karaoke! If you have always wished to be a pop star performing on stage in front of a couple hundred people, it’s time to shine. But you should encourage yourself to do it as soon as you can. Otherwise, you will not be able to compete with the drunken uncle who wants to sing all night long. Fourth stage: This is the grateful moment. The bride and groom will go back to the lobby again to say goodbye to guests and to take group photos. There might be an after party but this is typically for close friends and family. You might be wondering why I have to mention what not to say to the new couple. Sometimes I attend a wedding and often feel like I don’t know what I should and shouldn’t say to other people. So I often fiddle with my phone and smile a lot. However, there are also some sentences that might sound like blessings to you, but in fact, it’s quite sensitive to the listeners. Their child plan: This is a common question that many mid-range or older Vietnamese people ask of the married couple and not many young couples feel comfortable answering this intimate question. The wedding cost: Discussing the financials of the wedding is not a good idea. General complaints: Even if the food is really bad, the organization was all over the place or something goes wrong, don’t tell the couple or their relatives since the wedding is a special day.